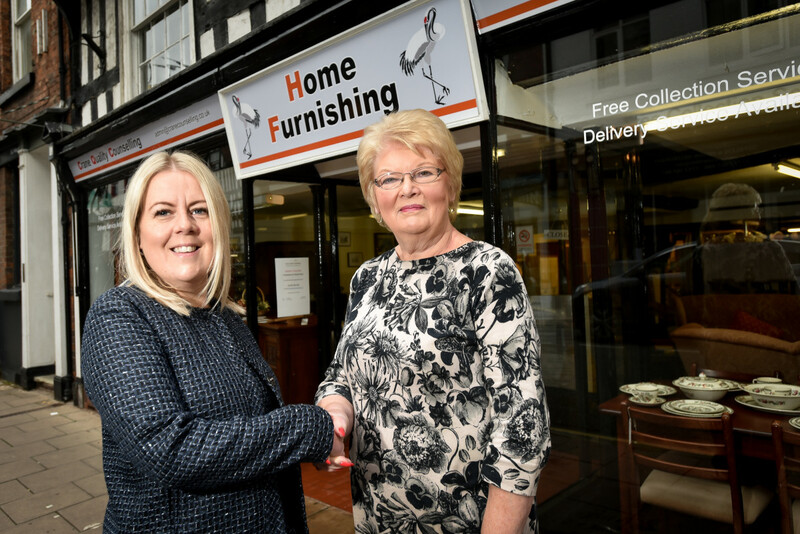 A building in central Shrewsbury which, until its closure two years ago, had been a prominent charity shop is once again providing the town with a rich selection of quality, second-hand household goods and furniture, having relaunched to raise funds for a new charity. Crane Quality Counselling was launched to fill the void left by Relate Shropshire which closed in October 2016. It was founded by former Relate CEO Lin Foley and a small group of likeminded experts in family and relationship counselling so that these services could continue to be delivered across the county. The new shop, which occupies the same unit on Mardol that the Relate shop had done previously, will provide much needed funds to support these services financially. “Whilst I did consider other locations, 51/52 Mardol has a long history as a charity shop and its striking black and white façade, quirky features and abundance of charm always proved popular with shoppers in its previous incarnation. Having previously been a shop, the unit has required minimal alteration and the only necessary work has been redecorating, plus some essential plumbing and electrical upgrades. Lin continues: “As a newly formed and independent charity, we do not currently have the funds to spend on elaborate renovations. This was another reason for this shop being the perfect location for us. The shop is being manned by a team of volunteers who will focus on selling quality second-hand furniture and other household goods. A free collection service is available to anyone wishing to donate in the local area, whilst delivery for a small fee is offered to those purchasing the goods. The charity is keen to hear from new volunteers able to spare time to run the shop and necessary retail training will be provided where needed. Legal support was provided by the Commercial Property team at FBC Manby Bowdler. “We had worked previously with one of Crane’s Trustees, so it was an honour to be recommended by them to Lin so that we could support her with the lease on the shop on Mardol.